OTTAWA—Prime Minister Stephen Harper is scheduled to meet with Chinese leader Xi Jinping on Sunday, Nov. 9. It will be the first official meeting between the two leaders since Xi took power. Harper’s trip has so far mainly focused on increasing trade between the two countries. Back home, the NDP and Amnesty International are among those who have levelled clear calls to the PM to raise human rights concerns with Xi. NDP Human Rights Critic Wayne Marston said there is talk about trade relationships with China around the world, but the issue of human rights has not been emphasized, including the forced harvesting of organs from prisoners of conscience to supply a gruesome trade in human organs. “There are all kinds of situations in China that concern us, from Uyghurs to Falun Gong to organ harvesting. All those should be topics of conversation when they meet privately,” said Marston of meetings between Harper and Xi. 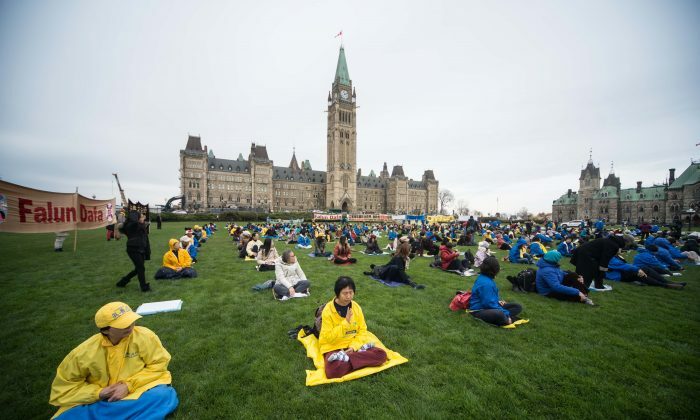 “It is clearly an important issue of human rights that needs to be articulated,” noted NDP Foreign Affairs Critic Paul Dewar, speaking on Parliament Hill while hundreds of Falun Gong adherents were gathered outside on the lawn Nov. 4, a day before the PM left on his trip to China. “That is something that should be part of PM’s briefings when he is speaking to the leadership in China, because human rights and diplomatic relationship go hand in hand,” Dewar said. “Canada and China’s relationship matter to both countries and that relationship must be grounded in human rights,” said Alex Neve, Secretary General of Amnesty International Canada, at a press conference on Parliament Hill on Nov. 6. According to Neve, there have always been challenges to being strong on human rights, amid worries that Canada will suffer on the trade front, and now there are concerns surrounding espionage and cyber security. “None of that can ever serve as a reason to go soft on or ignore or overlook human rights concerns,” Neve said. Green Party leader Elizabeth May urged Harper to speak out for human rights and religious freedom and to deal with the issue of organ harvesting. “The stories of organ harvesting from Falun Gong—Falun Dafa—and other political prisoners of the People’s Republic of China are devastatingly cruel and horrible to imagine,” said May. Late last month Immigration Minister Chris Alexander told a human rights round table that Canada would continue to call for the rights and freedoms of persecuted groups like Christians, democracy activists, Falun Gong adherents, Tibetans and Uyghurs. He said the recent arrest of Kevin and Julia Garratt, two Christians arrested on accusations of spying but held without charges, had galvanized the government’s policy. “I don’t think there is any case to illustrate our frustration in speaking these issues to China as clearly as the Garratt case,” he said.